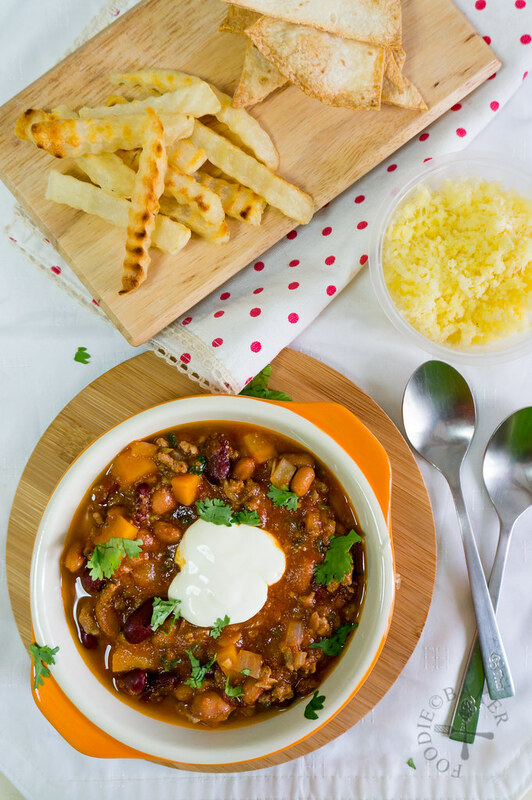 Chili, or chili con carne, is a spicy stew containing chili peppers, beef, tomatoes and beans. Now, apparently there is quite a lot of dispute on the list of ingredients – the type of meat, type of beans and whether tomatoes should be used etc. But here in Singapore, the version served in restaurants usually contain these ingredients so that’s the version I made. I adapted Jamie Oliver’s recipe, omitting the celery and swapping out the chickpeas with pinto beans (I felt that the texture of chickpeas will be a little weird in the chili). A friend commented it’s not spicy enough, so I’ll probably add in chili peppers for her in the future (though I’m not sure where I can get them…) but since X and I cannot take over-ly spicy food very well, I think we are better off with this version that is without any chili peppers. The rest of the ingredients are very easy to obtain – I thought there wouldn’t be any pinto beans, but surprisingly I found them in NTUC Xtra (in canned form with the kidney beans), yay! 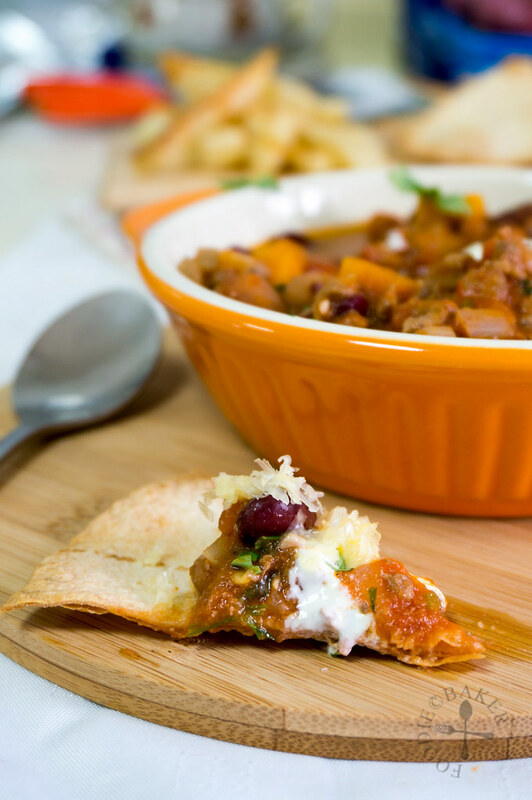 Preparation for this dish is also effortless – it’s actually a one-pot wonder! 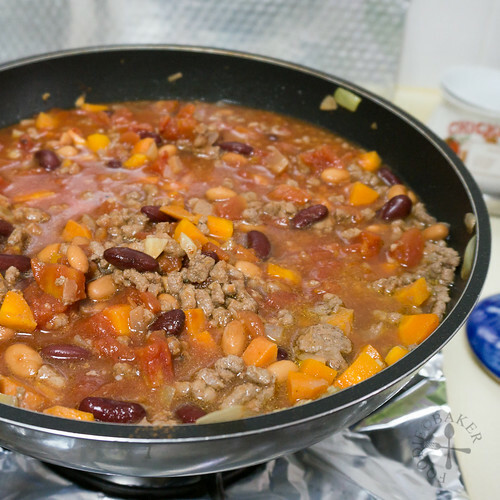 I love how the meat, vegetables and beans come together to create a myriad of textures. My favourite way to eat them is to scoop them using tortilla chips as my spoons and sprinkle Parmesan cheese on top. The tortilla chips are home-made and baked too! It’s so quick and easy to make these tortilla chips – another friend of mine love adding tortilla chips into her salads, so I’ll definitely do that too! I also made fries to go with the chilis, but I think tortilla chips are way better. 1) Peel and dice onion and carrot. Peel and minced several cloves of garlic. (This is probably the toughest step!) 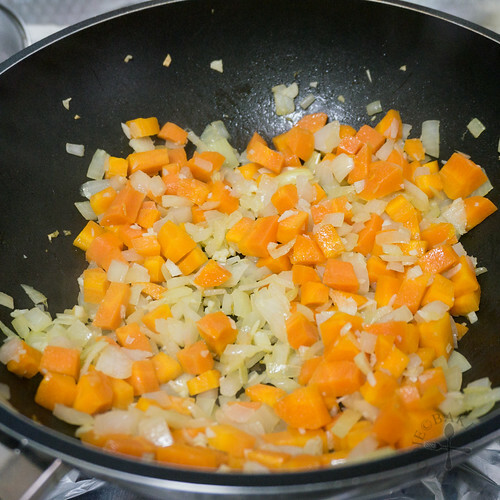 2) Sauté onion and carrot until onion has softened and become translucent. 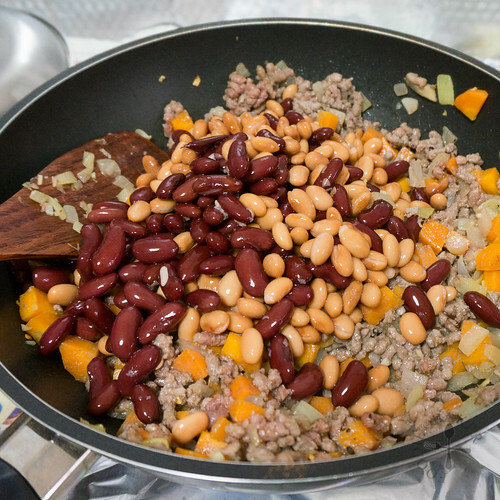 5) When the beef is no longer pink in colour, add in the beans. 6) Followed by the canned tomatoes. 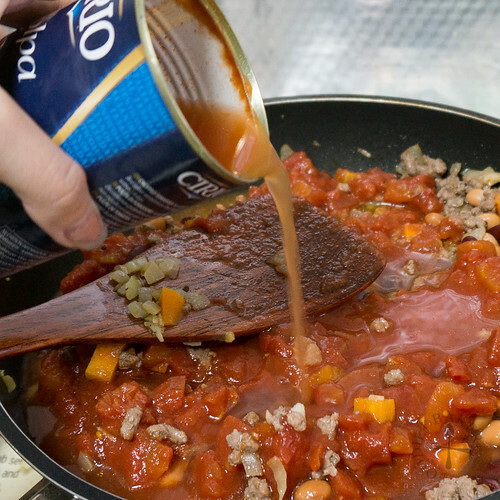 7) Fill a can with water and add it into the pot. Bring it to a boil. 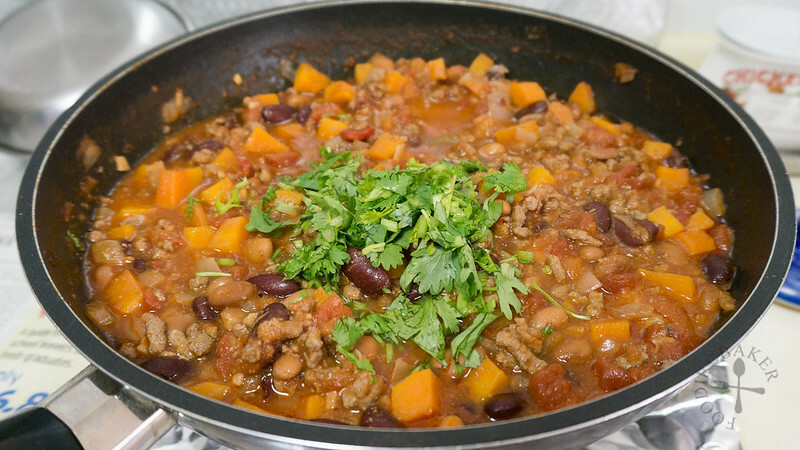 8) Turn down the heat and simmer for 45 minutes to 60 minutes for the flavours to meld together. Stir in cilantro and it’s ready! 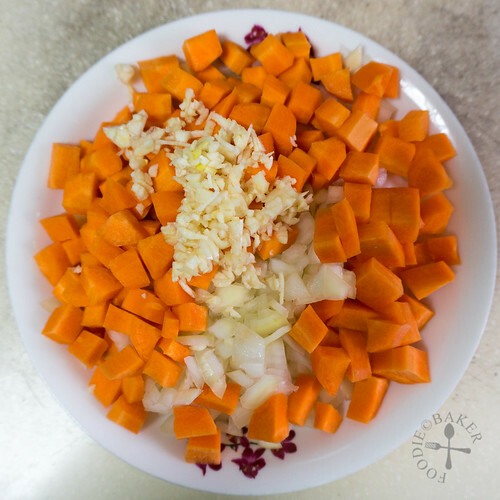 In a large pot over medium heat, heat the oil until hot and sauté the chopped onion and carrot until onion is soft and translucent, about 5 minutes. 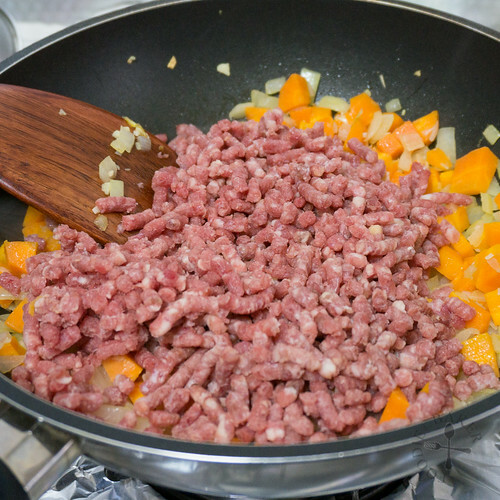 Create a hole in the middle of the pot and add in the garlic, ground beef, cumin, chili flakes and cinnamon. Cook until beef is no longer pink. 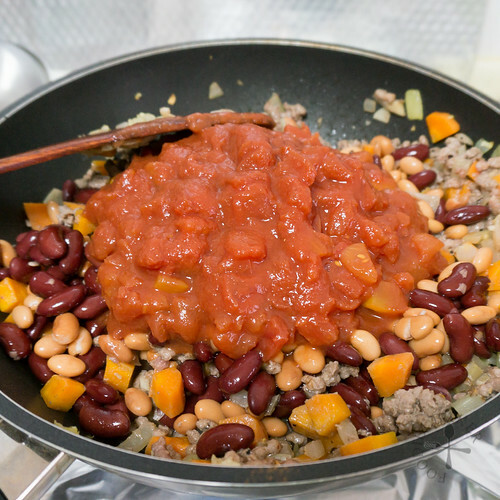 Add in the the beans, chopped tomatoes and 1 can of water. Bring to a boil then turn down the heat and simmer for 45 to 60 minutes, stirring occasionally. Stir in the chopped cilantro. Scoop into serving bowls. Garnish with extra cilantro and a dollop of sour cream. 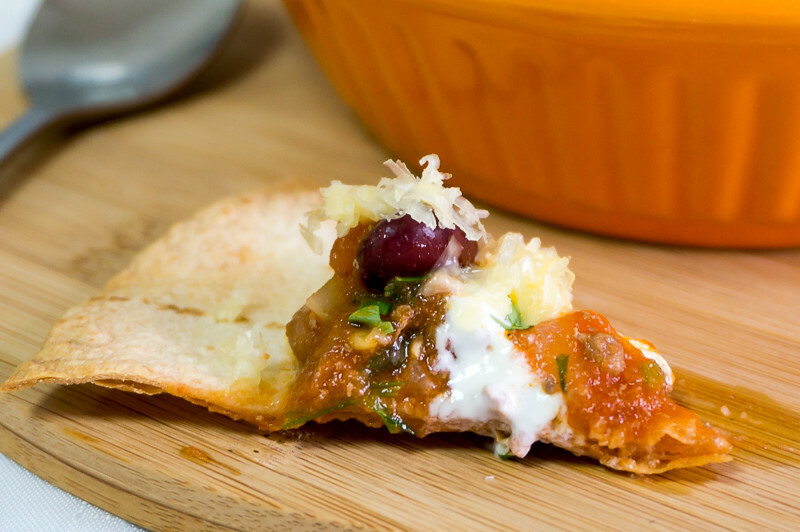 Serve with Parmesan cheese, tortilla chips and/or fries. 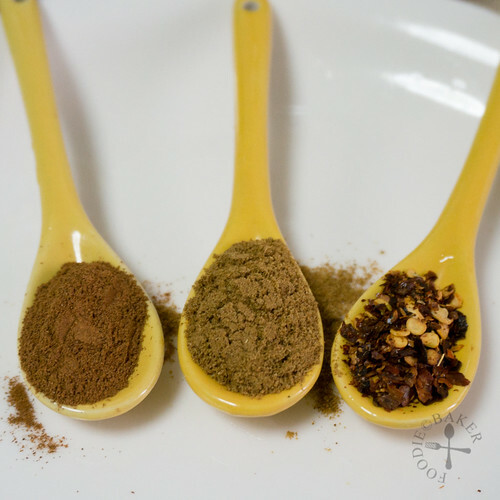 - Add in more chili flakes or other types of chili (like jalapeños) for an additional spicy kick! Preheat the oven to 180 degrees Celsius. Line a baking sheet with baking parchment and set aside. Grab your tortillas and using a pizza cutter or a pair of scissors, cut them into 6 or 8 pieces (depending on how big you want your chips to be). Lay them on the lined baking sheet, slightly apart from one another. Bake for 8 to 10 minutes until the tortilla chips are lightly browned and crispy. I love your homemade tortilla chips. 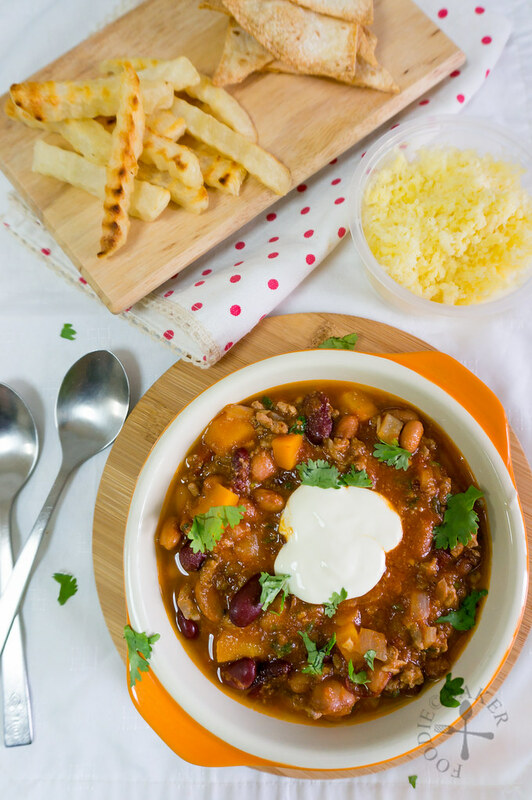 I love your chilli corn carne even more as it is less spicy which my kids can enjoy too! 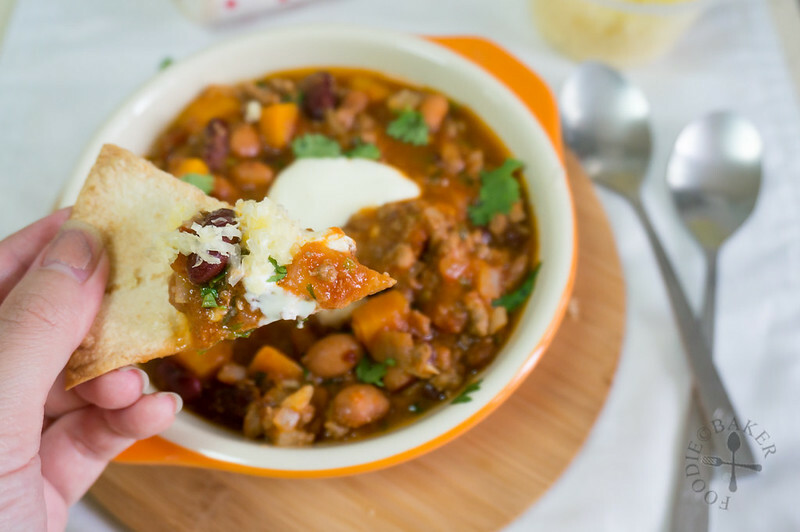 I love homemade tortilla chips and seeing them getting dunked in your homemade chili with cheese and sour cream. Oh my you are making me hungry! Sharing of course!!! Delicious Jasline and I love your photo’s they are spectacular!! !